We're all for choice, but Panasonic has way too many TVs. Surrounding this LCD TV in the Viera range are all kinds of combinations of resolution, panel technology, extra features and size, though it's the TX-L32S10's Full HD LCD panel that helps make this an entry-level telly that's definitely worth considering if you're on a tight budget. Part of Panasonic's Viera S10 series, it has siblings in the form of the 37-inch TX-L37S10 and the 42-inch TX-L42S10 LCD TVs. So what's unique about the TX-L32S10? It's very low priced for a Full HD model from a big brand, that's for sure. And with a more solid build than most, it certainly feels better value. Aside from that, it's the TX-L32S10's SD card slot that might give it niche appeal. As well as being handy for inspecting digital photos straight out of any camera, the slot also handles SDHC cards that are primarily found in camcorders. Although it can play home movies as AVC-HD video files straight from a hi-def camcorder, the TX-L32S10 is decidedly low-brow when it comes to digital media. Although its media player can be accessed quickly from its pop-up Viera Tools on-screen menu bar (accessed via the remote), only AVC-HD and JPEG files can be displayed. There's no compatibility with DivX movies – as there is on the step-up TX-L32V10 model – and, rather more oddly, no provision for playing MP3s. Aside from its very limited digital media skills, the SD card should also be considered a little limiting, and I'm sure most of us would prefer a standard USB input. Elsewhere on the TX-L32S10, you could argue that we deserve an LED panel; while it's certainly not expected at this size or price, it's something we've seen lately from competitors, most notably on Sharp's 600E Series. Budget LED screens are something that have appeared only very late in 2009; the TX-L32S10 was first announced back in March. Not that Panasonic doesn't dabble in high-end televisions. 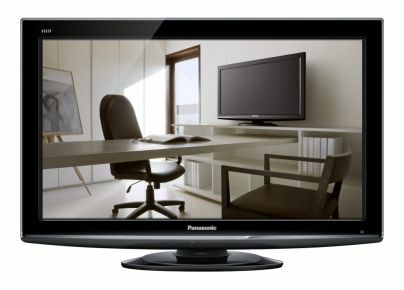 Sitting just above the HD-ready X10 and X15 models, this S10 Series is Panasonic's entry-level Full HD set. Further up the Viera line-up you'll find PC networking and 100Hz processing as part of Panasonic's more powerful Vreal Pro 4 engine, while its high-end NeoPDP plasma TVs promise 2,000,000:1 contrast. The V10 and the G15 screens feature both internet access to YouTube, Picasa and Eurosport through a Viera Cast online internet portal and (along with the G10 Series) integrated Freesat tuners. In 2010 we expect Panasonic to unveil its ultra-black and bright NeoLCD technology, though it's doubtful to feature on a 32-incher like the TX-L32S10. Lastly, although the TX-L32S10 is a cinch to use, the user interface is starting to look a bit dated. These are the same on-screen menus that have graced Panasonic TVs for as long as we can remember, and they now seem tired – especially with the likes of Samsung and, in particular, LG, coming up with some superlative user interfaces recently.